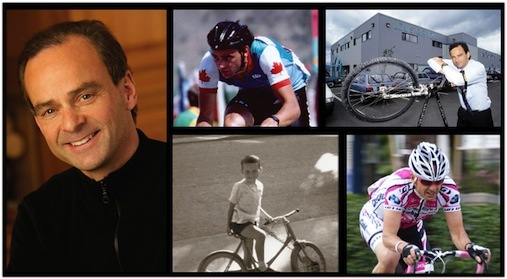 Cycling to success with Louis Garneau | Isabelle Chrun M.Sc. Some say you have to suffer to be beautiful. Others think that you have to suffer before becoming successful. From a cyclist’s point of view, pain is not a choice, it remains in the equation win or lose. How frustrating can it be to lose a race even though you have survived all that trouble? The president founder of Louis Garneau, who has been involved with cycling his entire life, believes that there are benefits from those lost races. This is how Louis Garneau believes we need to suffer in order to succeed. It is a matter of how one can resist to pain. His vision of victory underlines the importance in losing. Every time someone congratulates him for his 150 won races, he replies that he also lost 500 races. Louis Garneau says that we need to lose from time to time, because a person who always win is somehow dangerous. To his eyes, cycling is not only a sport, but also a lesson of survival. Athletes have to manage their water, their food, their energy and the unpredictable weather to last those excruciating kilometers. Not only they have to plan their resources, but they also have to compete against 200 other cyclists. M. Garneau’s cycling intuition helped him face the imponderables in business to reach an audience of millions worldwide through quality products. Amazingly, this president doesn’t come from a business school, he is rather an arts passionate. I suppose his creative side surely contributed a lot to the innovative products that exceed expectations. Louis Garneau’s competitive advantage resides in their top notch cycling gear. This product-driven company holds the number 1 spot in Japan. It also provides the equipment to several professional cycling teams around the globe. Of course, creativity can’t be the sole reason to his impressive achievement. This leader knows how essential it is to surround oneself with the best people. Success in business hinges on one key point: finding the best team. It is crucial to rub elbows with persons who are smarter than yourself. The president founder also brought up the value of a healthy company. Spinning lessons are available to motivate employees to stay in shape, which is coherent to the company’s philosophy. My Amazing Friends Helped Me Win an iPad!